More a novelty then a long term toy. For anyone looking for a quick restraint type of thing look else where. This isn’t worth the time or money it takes to get and use it. When I first bought these I thought it would be great for me considering I'm allergic to the adhesive on tape, but from the time I first tried to use it, it was a disappointment. The tape stretches out if you pull a little harder then needed to pull it off itself. Then it is super-hard to try to roll back up when you are done. his product is not really comfortable and pulls little hairs on your body. On top of that it is just hard to deal with and time consuming. If you want something to use as a restraint without getting tape, get rope, or anything but this. It did not hold up like it should have, stretched apart, and was time consuming to use which kind of killed the mood. I will never buy this again and I recommend you don’t invest in it either. 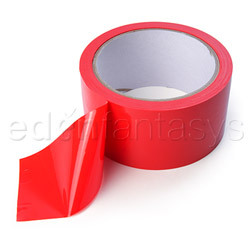 At least if you buy duct tape you can use it for other things too, unlike this product. Reviewed by alwaysmalice (Eden Writer) How do you know you don't like it if you've never tried it? I don't vote right away on reviews I proofread, but I'd like to recommend the Mentor Program. You can read more about it in this forum thread. PV's advice is spot-on. The mentor program is highly recommended, and helped me out a lot!